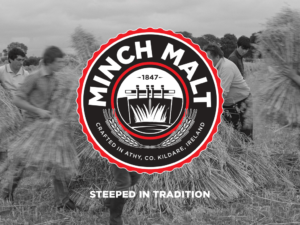 Suppliers – Kildare Brewing Co.
Minch Maltings, based along the Grand Canal in Athy, County Kildare has been one of the leading maltsters across Europe since it was formed in 1849. We are delighted to be working with not just a local producer but a producer who like us looks at every detail so their product is consistent & the freshest possible. Minch Malt is also a member of Origin Green (Bord Bia’s Sustainability Programme) which mirrors the core values of what we do here at Kildare Brewing Company. Minch Malt work with farmers from all over Ireland but their core suppliers would be from the Kildare/Carlow/Wexford region & that means alot to us here that we are in some way helping & supporting local jobs. We get all our malt whole which allows us to crush the grain fresh on site, thus guaranteeing that you the customer is getting the freshest produce into your beer. Simply Hops are a wholesaler of Hops (Bittering & Aroma of Beer) which we use on a regular bases. They supply us with the freshest whole cone & pellet form hops at premium prices, but the quality of their products speak for themselves. Hops come from all over the world & now the demand for hops due to the craft brewing industry has increased exponentially over the last 10 years & with Simpy Hops being one of the biggest hop merchants in the UK, they always have a constant supply & quality which we know we can trust. They also have a huge selection, whether its spicy & noble hops from England or Germany or tropical & fruity hops from America, New Zealand or Australia.